Spring is taking quite a long time to arrive here, so will this Trend Edition (here in May, whereas it's already available in other EU countries, as usual). In the meantime...promo images! La primavera si fa attendere, ma le collezioni primaverili no! Beh ecco, magari da noi arrivano più tardi, come la Floral Grunge Essence (il solito mese dopo gli altri paesi europei)...Nel frattempo accontentiamoci delle immagini promozionali! opposites attract! 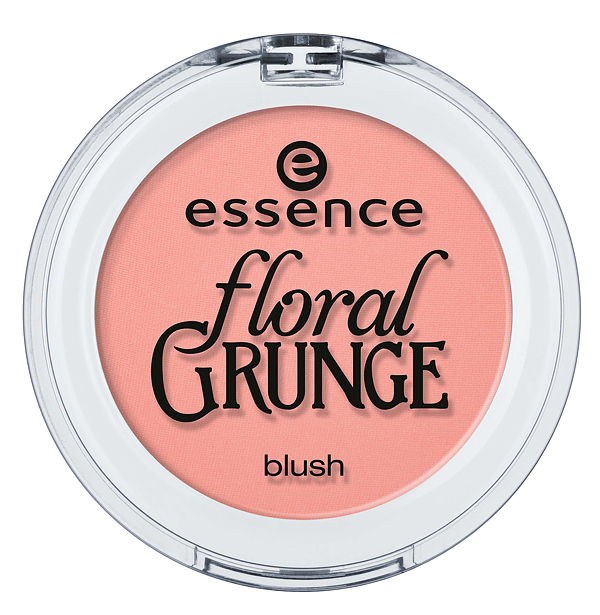 the new essence trend edition “floral grunge” unites floral, feminine elements with cool grunge accents in april and may 2013. soft and intense colors, fine and rough textures, floral lace designs and edgy studs – playful hippy chic meets casual grunge style! this trend edition offers so many highlights: the stick-on eyeliners with a velvet or stud look and the hair powder for eye-catching color in your hair are absolute must-haves. smells like spring spirit! floral vs. grunge! i meravigliosi colori della gamma ombretto quattro regalano un make-up occhi davvero unico con effetti dal metallico al matt. la versione chiara si adatta allo stile floral grazie ai colori bianco, rosa, corallo e menta. la versione scura invece è perfetta per uno stile grunge dai colori intensi come il beige, lilla, verde e nero. disponibile nelle versioni #01 eye like flowers e 02 eye like grunge. flower girl or rock chick? both, of course! all beauties will love the innovative stick-on eyeliners. 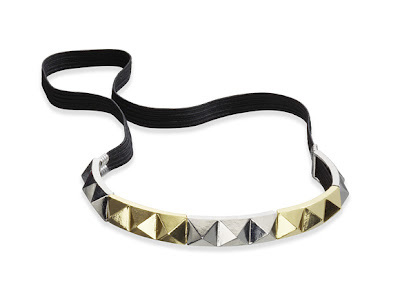 select your favorite with a velvet appearance or small studs and stick on your eyelid. the super easy application ensures a perfect eyeline. totally cool during the day for fans of extroverted styles and a true make-up highlight at every party during the evening. can be used multiple times. flower girl o rock aggressive? tutte le ragazze ameranno l’innovativo eyeliner occhi adesivo. scegli il tuo disegno preferito e applicalo sulla palpebra. la formula di facile applicazione assicura un eyeliner perfetto dall’incredibile effetto velluto. adatto ad ogni occasione, per il trucco di tutti i giorni o per una festa esclusiva. riutilizzabile più volte. perfect when you’re on the go, whether you’re heading for an open-air festival or a cool underground club. depending on your mood, you can choose from three cute mini-lipglosses to find the ideal shade for your trendy spring look. two different sets with soft or strong colors that are an absolute must for every purse! the soft version contains transparent glitter, soft rose and coral and the more intense version colors your lips in pink, cool lilac and mint. available in 01 kissing me softly and 02 grungy kisses rock! turn coral: the silky-matt texture of the blush is easy to apply, spreads evenly and feels wonderfully soft on your cheeks. 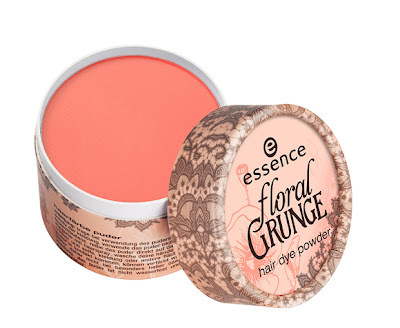 the blush offers intense results in coral-pink. for a unique spring complexion! here come the nail polish trends of the spring season: fresh, floral and a little smokey in mint, pastel white, soft coral, purple and black. the effects also guarantee plenty of diversity and extremes: from matt to pearly to the edgy “grip tape look” usually reserved for skateboards! long-lasting and breathtaking, these popular nail polish give your nails the perfect finishing touch. available in 01 be flowerful, 02 lily bloom, 03 grunge me tender!, 04 madly purpled and 05 black to the roots. ecco gli smalti della primavera che è alle porte: colori freschi, floreali nelle tonalità menta, bianco, corallo, purple e nero. anche gli smalti garantiscono effetti diversi: dal matt al perlaceo fino all’incredibile effetto “grip”, davvero aggressivo! il tocco finale per un look unico dall’effetto mozzafiato, qualunque sia il tuo stile! 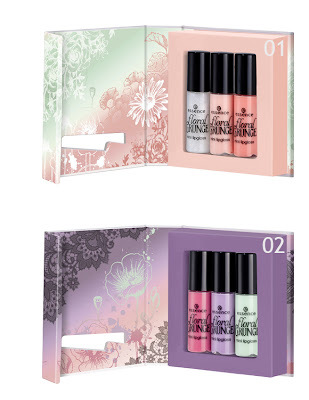 disponibile nelle versioni #01 be flowerful, #02 lily bloom, #03 grunge me tender!, #04 madly purpled e #05 black to the roots. in the mood for a tattoo but don’t want it to last forever? we’ve got the perfect solution with the stylish body tattoos for your face and body. a guaranteed eye-catcher! 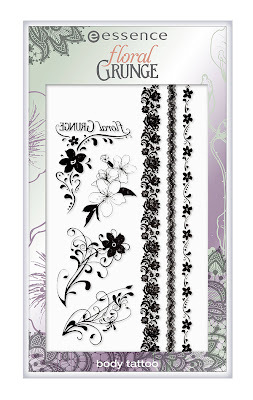 the tattoos stick to your skin really well and are easy to remove with our 2-phase make-up remover. vuoi un tatuaggio ma che non sia per sempre? ecco la soluzione: i tatuaggi per viso e corpo essence. facili da applicare, aderiscono perfettamente alla pelle e si rimuovono con lo struccante occhi bifasico. coloration to go… the pressed hair powder creates colorful highlights in bright coral to lure the first ray of sun out from behind the clouds. simply apply on the desired strand or area of hair and wash-out when you’re done. a unique must-have for all individualists going for a cool look this spring. 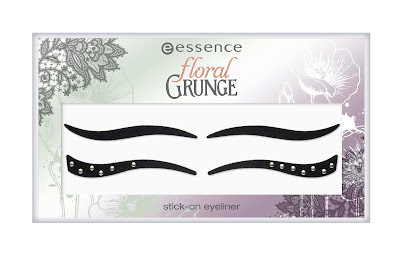 the rock-chick hair band with trendy studs completes your gorgeous “floral grunge” look. be a floral grunge girl! la fascia borchiata per capelli completa il tuo incredibile look “floral-grunge”! 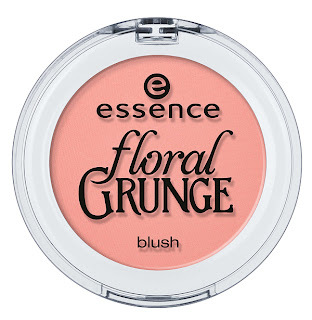 ora sei una vera floral grunge girl! Nel complesso la trovo carinissima,ma niente di nuovo..
Ho cercato un po' in giro, ma per gli smalti non ci sono ancora "swatchatrici" fidate (da Germania o altri paesi), appena trovo linko (o se trovi prima tu, segnala pure)! Grazie!! A seconda delle foto il nero mi piace poco o abbastanza :-/ Mi ispira la finitura del verde...(io sento "suede" e non capisco più niente, però mi pare che siamo lontani dagli Opi).